Time is a precious commodity in schools; there’s never enough of it. So, when your mentors and peers—and even complete strangers—give you the gift of their time and uninterrupted attention to focus with you on a dilemma you’re grappling with, it can be a transformative experience. 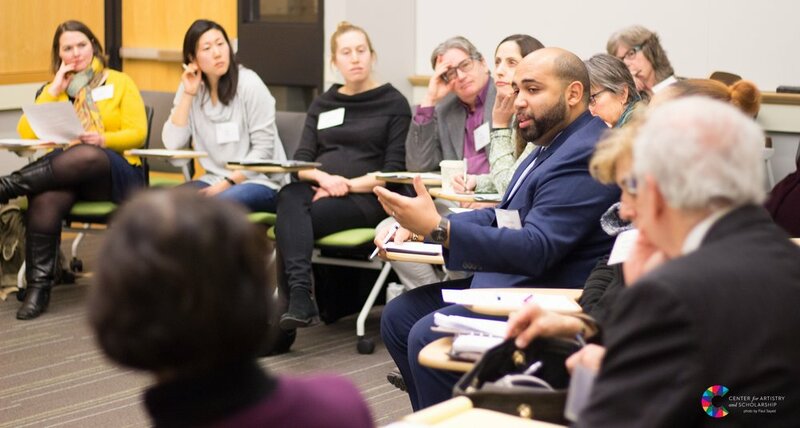 On January 19, 2018, at Gutman Library at Harvard Graduate School of Education, over 100 educators and leaders gave their time to support the work of 18 emerging leaders participating in the Perrone-Sizer Institute (PSi) for Creative Leadership’s Mid-Year Capstone Consultancy Day. These guests included over two dozen principals and district administrators, as well as our partners at the University of Massachusetts Boston, including the Dean of the College of Education and Human Development, Dr. Joseph Berger; the Chair of the Department of Leadership in Education, Dr. Tara Parker; and Graduate Program Administrator Amy Collinsworth. The purpose of the Consultancy Day was to give members of PSi’s 2017-2018 cohort the opportunity to present and—with the help of those gathered—explore a question arising out of their Capstone Leadership Projects—collaborations each of them is developing this year between community-based partners and her or his current workplace to address a common goal. Presenters were joined by principals, mentors, peers, and students they had invited to engage in their presentations. In addition. they were joined by other attendees invited by PSi Co-Directors Linda Nathan and Carmen Torres. Typically, these guests were attracted to a particular session by the title or key question shared on the event schedule. We are already looking forward to next year, and to the challenge of giving more time to questions that matter and conversations that lead to better outcomes for children and families. Applications are now being accepted on a rolling basis for PSi’s 2018-2019 cohort, and we invite you to share this opportunity with emerging leaders you know. Learn more here or contact PSi Program Manager Lisa Sankowski at lsankowski@artistryandscholarship.org for more information.